In your 'modern world', the Captain of the Acasta is Albert Roberts, mild-mannered high school Digital Design teacher. Before teaching, Roberts was a professional Graphic Designer for ten years for various design firms and sign companies. Roberts spends his free time in the pursuit of strange and obscure medical and scientific knowledge of the 18th & 19th centuries, and typically has a heap of books on his night stand that range from period texts and journals to historical fiction. Roberts has been interpreting history and reenacting since 2001. 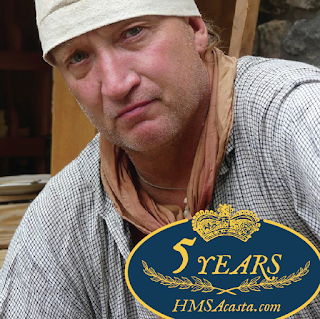 Roberts helped to found the Acasta group in 2011 and has gone on to lead the group and grow it into one of the largest Royal Naval reenactment units in North America. When asked why he doesn't portray a specific historical captain, Roberts replies, “My love is for passing on the knowledge of the era... not for trying to BE some particular historical figure. That way, the public doesn't get hung up on who I AM, but instead what I'm DOING becomes more central. Just as it SHOULD be." When not adding rowdy sailors to the defaulter’s list, or teaching design to the next generation in a classroom, Roberts stays busy chasing after his four daughters. Shea W. McLean was born and raised in Mobile, AL and is of Scottish and English heritage. His father was a steamship agent in the Port of Mobile which is, presumably, how he received his fascination with all things maritime. McLean was an exchange student at Kings College, University of London, in 1986 and received his BA in History at the University of South Alabama in 1987. While still in college, he received his commission in the United States Army in 1984. 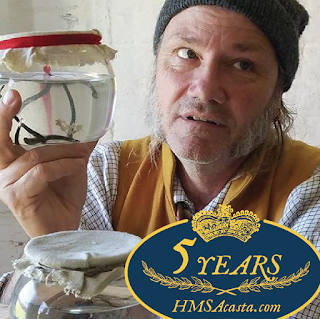 After a brief stint in the Army, McLean decided to continue his education and received his MS in Nautical Archaeology at The Florida State University in 1997. Since then, McLean has pursued a lifelong career in nautical history and maritime archaeology. Over his 30+ year career as a marine archaeologist and museum curator, McLean has worked on a myriad of archaeological projects and is a member of several historical societies. His archaeological exploits range from early vessels of exploration (De Luna’s 1559 colonization fleet) to a number of civil war era vessels (Confederate submarine HL Hunley, CSS Alabama, etc.) with a healthy dose of colonial vessels in-between. McLean’s expertise and interest lay mainly with historic artifacts, ship construction, celestial navigation, and maritime history. He has been a living historian and reenactor since 1998. McLean currently serves as the Curator of Battleship USS Alabama Memorial Park in Mobile, AL. He spends much of his time with his beloved wife Caroline Newton-Jones McLean (Portsmouth, Hampshire, UK) and his three cherished daughters: Brooke, Chelsea, and Katherine. John Frank Jarboe was born in Breckenridge County Kentucky and raised on a farm near the tiny town of McDaniels. Graduating from high school in 1973 he was never interested in history. 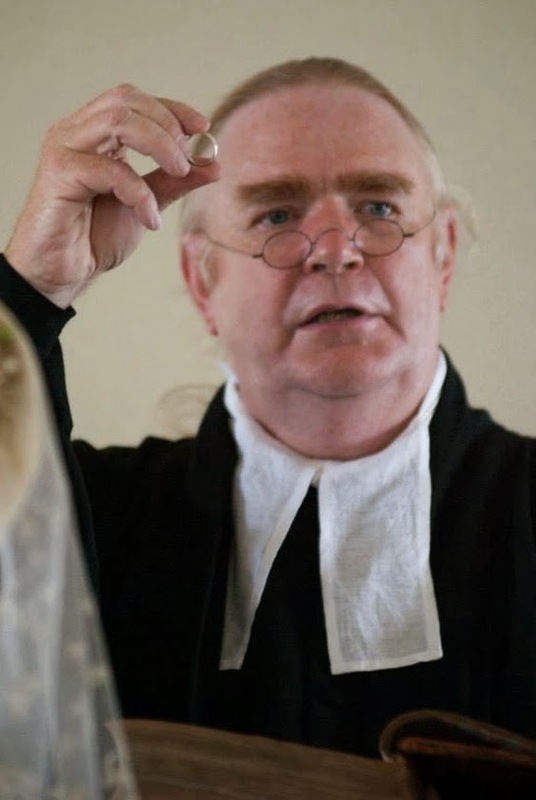 But since, in addition to tracing his genealogy back to the 11th century, Frank has spent the past 25 years researching the events surrounding The Second Great Awakening of 1800 and the religious atmosphere in the 17th to the early 19th centuries. Frank spent 35 years as a photographer, with most of those years being the manager of a professional photofinishing lab. In addition to his years in photography, Jarboe and his wife Carol along with their two daughters operated a small farm on which they raised sheep, horses and chickens. They also ran a horse-drawn carriage service for 10 years. Frank & Carol are grandparents to 6, one of which resides in heaven. 'Mr Nicholas Armitage’, the ship's Purser, is one of the 'nom-de-guerres’ of Steve Diatz, who has forayed into the genre of 'living-history re-enacting' for about 40 years, developing many 'historical personas' from the 18thc, 19thc and 20thc. Born in Washington, DC, formative years in Los Angeles, college at U.C.L.A. earning a BA in History, and then long-time resident of nearby Alexandria, Virginia, Steve worked for 30 years at Alexandria's public library. Married to a college professor and former Army and hospital nurse, he has many sojourns over to the British Isles in his lifetime. Some of his 'characters' include a Civil War newspaper correspondent, Georgian-era 'gamester', WW2 British Reconnaissance 'Tommy', Irish 'Volunteer' of the 'Troubles' (1919-21), late 1920s motion-picture director, 1940s press photographer, as well as many years spent as doing many AWI, ACW, and WW2 battle re-enactments. Steve favors a 'first-person interpretation' when possible, and also enjoys employing the 'material culture' (original and reproduction items) of these times. He likes to craft 'historical tableaus' to help tell the story of the situation and times he portrays in the field, or at historic sites, such as Gadsby’s Tavern Museum in Alexandria, VA., Civil War camps, and more recently, at Jazz-Age lawn parties. His biggest life-time artistic influences are 1930s/40s dance-band music and films of that era, as well as being a devoted MLB and NFL enthusiast (Nationals and Ravens), attending many games each year. Steve is always looking for fresh challenges in the historical realm. When Ship’s carpenter Jim Apple isn’t keeping the Acasta afloat, he’s often under a horse. Jim makes his living as a “Equine Podiatrist” - that’s a farrier to some of us. Jim doesn’t use horseshoes, he specializes in natural hoof care (although he is an accomplished blacksmith). Jim and his wife Mecca live on the beach in Navarre Beach Florida where they also run a mobile bookstore- Story tree books. The store is made from a former hot food truck which Jim and Mecca renovated themselves. Jim even painted the artwork on the truck side. 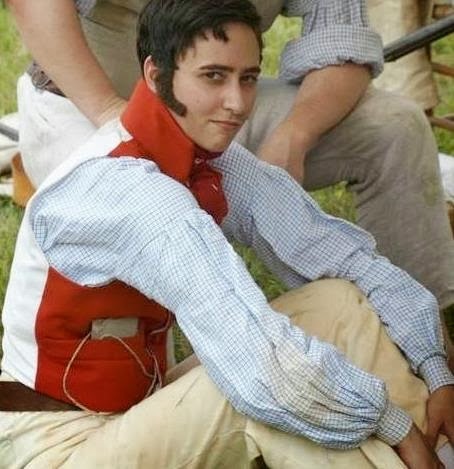 Aside from re-enacting a British tar of the Napoleonic war period, in the 18th century Jim portrays a Chickasaw warrior. He coordinates the Native camp at the Annual “Raid on Martins station”. grandfather (many times removed) of Tony Gerard. For over 20 years Tony has taught biology and physical geography at Shawnee Community College in southern Illinois. Prior to that he taught junior high/high school biology and earth science in central Illinois. When he can find the work, Gerard works part time in film production. Beginning as one of the core extras in "Last of the Mohicans", he has worked on over thirty other productions to date. A self professed "nature geek", he lives with his wife Berna and their twin sons on the edge of Wildcat Bluff in the Cache River State Natural Area. In addition to living history they are both active volunteers in local environmental educational programs. Reptiles and amphibians are of special interest and they share their home with varying numbers of turtles, snakes, salamanders and frogs. Gerard began re-enacting in the early 1980s with the eastern frontier of the 18th and early 19th century as his area of special interest. 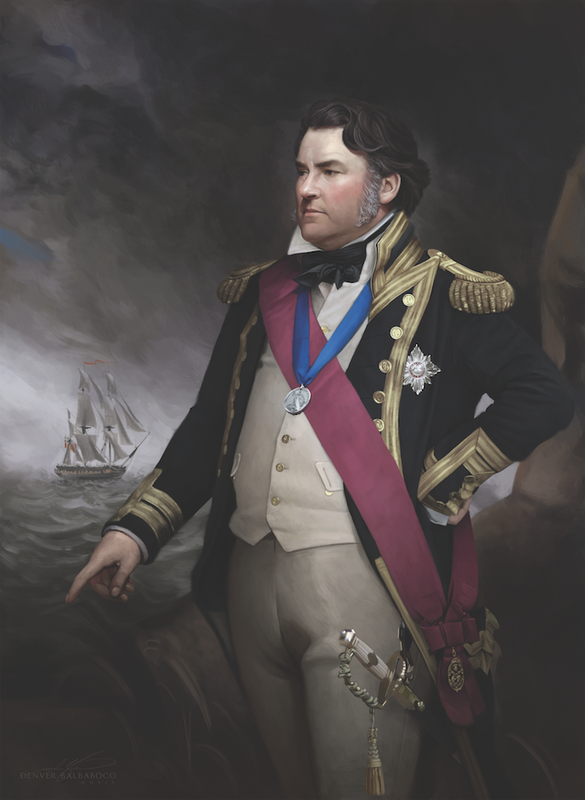 Portraying a naval surgeon's mate is an entirely new endeavor. His favorite facet of this new persona? "I've been fortunate to be able to travel to some far off places in my life. 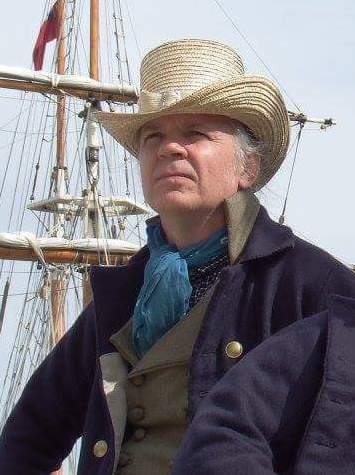 Portraying a well traveled old sailor allows me to incorporate some of those far off experiences into my 19th century persona". In the real world Charles Winchester is retired from thirty years service with Georgia State Parks and Historic Sites. Twenty-three of those years were as Manager of Fort Morris Historic Site, a Revolutionary War/ War of 1812 earthwork fort, and as Manager at Pickett’s Mill Battlefield State Historic Site, a Civil War battlefield near Atlanta, Georgia. Long before that career, however he had a love for living history. Growing up in Charleston, S. Carolina he was surrounded by history and living history, including the centennial celebration of the American Civil War, the Tri-centennial of the founding of S. Carolina and the Bi-centennial of the American War for Independence. 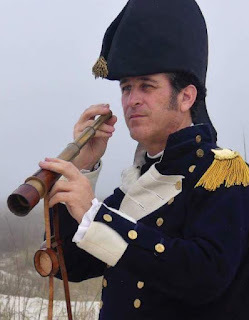 Charles was active from 1976 in the Bi-centennial, attending several of the 200th anniversary battle reenactments across the country both as a rebel, a redcoat, a Hessian Grenadier and finally a French infantryman at the 200th anniversary of the Battle of Yorktown. Beginning in 1980 Mr. Winchester was a regular volunteer representing Civil War Union infantry and artillery at Fort Pulaski, Fort McAllister and Fort Jackson in Savannah, Georgia. During the 250th anniversary of the founding of Georgia in 1982, Charles was a mainstay at Wormsloe Historic Site representing a Marine Boatman of the Oglethorpe period during the War of Jenkins Ear. Doing interpretive programs and tours was an almost daily occurrence for the first twelve years of his career with State Parks. Charles was also active in American Civil War cavalry and infantry units during his time at Pickett’s Mill Battlefield. For seventeen years of his parks career he was Black Powder Safety Instructor for Georgia State Parks. He was a Georgia mandated peace officer, graduating from GPSTC in 1988. Winchester has a BA degree in History from Armstrong Atlantic University in Savannah, Georgia. Charles has been married to Lara Lee Rang Winchester (who he met at the two hundredth anniversary of the Battle of Trenton, in 1976!) for thirty-one years. Together they have three children and two grand children. Charles and Lara are both active with HMS Acasta as well as 1812, American War for Independence and French and Indian War living history. Aboard the Acasta, James Vasserman acts as the Doctor's personal servant. His occupation in the modern world is quite different. Vasserman lives in his 21st century world as an avid historical clothing researcher, re-creator, and advisor, and was recently engaged to utilize his historical clothing knowledge to retool a popular annual program at a well known historic site. 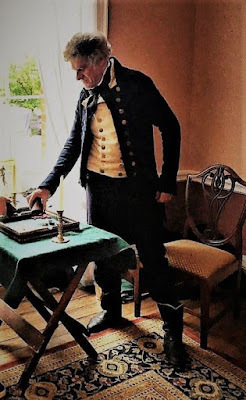 When not advising historic sites on their textile collections, sewing for himself, others, and his shipmates, or attending events in the most stylish garb, Vassermann can be found surrounded by books and internet archives researching every minute detail he can find. It has been mentioned privately that Mr. Vassermann bears a striking resemblance to the lovely young wife of Doctor Roberts. We don't see it.